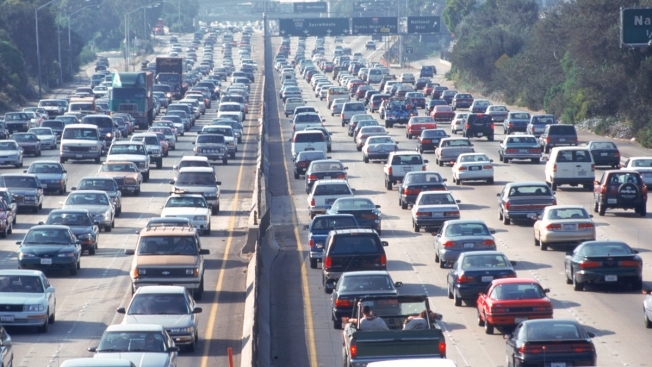 File photo of a crowded freeway in Los Angeles, California. If you're contemplating a move to a new state, you may want to consider not only the job prospects, but the stress level of the region as well. Career services site Zippia created a list of the 10 states where Americans seem to be the most stressed out. To come up with its ranking, Zippia looked at six factors, including long commute times, unemployment, hours worked, population density, home price-to-income ratio and the number of uninsured residents in each state. Zippia used data from the U.S. Census American Community Survey and gave each state a ranking from one to 50 in each category, with one representing the highest level of stress. It may not surprise anyone that states like New York and California — known for high-stress industries like finance and tech, as well as high costs of living and long commute — made the list, but many sunny southern states like Florida and Georgia also cracked the top 10. While Atlanta may seem like a city full of opportunities, Zippia found that the state of Georgia as a whole has a high unemployment rate, a high number of uninsured residents and a high number of employees with long commutes to work. In Florida, Zippia found that outside of the retired 65-and-over population, many Floridians are without health insurance. In fact, the state ranked No. 3 in the category of uninsured Americans. Earning the No. 1 spot for the most stressed American state is New Jersey. The garden state ranked highly for long work hours, long commutes and a high home price-to-income ratio. According to Zippia, Mississippi often makes the top 10 on its ranking of states with the most dangerous commutes. When looking at the measured stress factors, the state ranks highly for unemployed residents, uninsured residents and long work hours. If a low-stress environment is a priority for you, consider states like Iowa, Minnesota, Nebraska or North and South Dakota. According to Zippia, these are the least stressed states in America.